In the United States, manga have been regarded largely as a form of entertainment, an escapism that can be read at the beach or in a comfy chair or someplace similar. Japan, though, has a much broader view of manga. It's become a part of daily life, after all. Not only is manga entertainment there, it's also been used to educate audiences about certain people, places or things. Now that manga's become popular across the Pacific, some of those educational manga are coming over as well. Here are a few examples of educational manga that have caught our eyes in recent years. Albert Einstein, Ludwig von Beethoven, Anne Frank, Helen Keller and Mother Teresa -- all of them were great people in their respective eras, and all of them are profiled in the "Edu-Manga" line of manga being released stateside by Digital Manga Publishing. Astro Boy, Osamu Tezuka's classic star of anime and manga, acts as the anointed "guide through the 'Edu-Manga' adventure," This basically translates into Astro and his family doing something that's somewhat related to the featured character's area of expertise, someone asking, "Oh, hey, what was [INSERT FAMOUS PERSON'S NAME HERE] like?" and the biography beginning in earnest ... without Astro ever appearing in the manga again. The Beethoven manga reads like a typical "shoujo" (young girls') romance, filled with angst for the main character. The composer is depicted as a tragic figure, abused by his father, losing the young woman he loved to another man because of class differences and an affliction with his hearing. 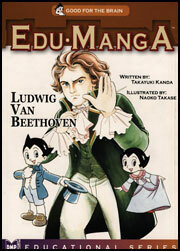 At least the Beethoven manga is entertaining reading. The Einstein manga instead reads like an illustrated physics textbook, rattling off the scientist's theories and adding the slimmest of biographical flourishes to force the story slowly along. Mother Teresa's manga offers an overview of her life, with an emphasis on her charity work, her care for the destitute and dying in India and her trip to Japan in 1981. Meanwhile, the Anne Frank manga plays out main events in the book "Anne Frank: Diary of a Young Girl," with additional scenes of the rest of her brief life in the Bergen-Belsen concentration camp. Helen Keller's story is much like other versions that have introduced young readers to the deaf and blind woman: It focuses on Keller's distressing childhood and the tireless efforts of her tutor, Anne Sullivan, who taught her not only language, but manners and etiquette as well. The strong focus on Sullivan and others who support Keller makes the manga worth a read. The Edu-Manga books share the unfortunate characteristic of presenting lists of important related people in a drab, crowded layout that overwhelms the reader before one word is actually read. That aside, the Edu-Manga series will likely inspire readers to learn more about the chosen subject, which is perhaps the main reason for these books in the first place. 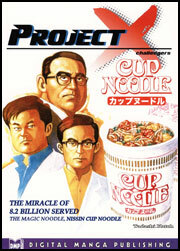 It's always a trip to read about the history behind the everyday gadgets and conveniences that we take for granted, and "Project X: Cup Noodle," also published stateside by Digital Manga Publishing, certainly soaked up our attention. The manga details the arduous process from conceptualization to reality and, ultimately, success of the world's first instant ramen in a container, Cup O' Noodles (originally named "Cup Noodle" in Japan), by Nissin Foods founder and director Momofuku Andou and his development team. Still, "Cup Noodles" is a thoroughly fascinating read. The struggle to create any successful product makes for great material, and the story of Cup O' Noodles reads as well as any drama, with the right splash of humor included. It definitely made me go out to buy -- and eat -- a few servings. For those hungering for more, publisher DMP has released other books in the "Project X" series detailing the rise of 7-Eleven and the Datsun Fairlady Z (the 240Z in the U.S., whose latest incarnation is the Nissan 350Z). With the nuclear aircraft carrier USS George Washington due to make Yokosuka, Japan, its home port in August, the U.S. Navy wanted to find a way to explain the carrier's mission to its future neighbors in a way that went beyond a typical pamphlet. Their solution was to commission writer Harumi Sato and artist Hiroshi Kazuma to produce a manga about the carrier. The strategy worked; the military newspaper Stars and Stripes reported that about 800 copies of the manga's 30,000-copy print run were given away June 8 ... in three hours. Fortunately, curious American fans don't have to wait in line in Japan to get a copy ... or know Japanese, for that matter. An English-translated PDF file (requiring the free Adobe Acrobat reader) is available online at tinyurl.com/6d2v8o. The art retains its original, right-to-left orientation in the translation. In "CVN 73," readers meet Petty Officer 3rd Class Jack Ohara, a Navy sailor on his first overseas assignment and his first tour of duty on board a carrier. Between the carrier's departure from (presumably) San Diego and Yokosuka, Jack transforms from a seasick rookie to THE MOST AWESOME NAVY SAILOR EVER. There's no other way to explain it. Halfway through the book -- about 100 pages -- he declares that he's accustomed to ship life. He helps fix aircraft. He puts out a laundry fire. He pushes a dumbfounded guy out of the way of an oncoming jet. AWESOME. That rah-rah spirit prevails throughout "CVN 73." Sure, readers get to see what life on board a carrier is like, but it all seems so sterile and efficient, one big happy family working together to defend allies and warn off potential enemies. The most contentious issue regarding the carrier's arrival in Japan -- its nuclear-powered core -- gets boiled down to two sentences: "Not only does the heart of GW have approximately a 50-year lifespan, it efficiently provides stable energy and doesn't require refueling. Considering the lifespan of the vessel, it could be said that GW can virtually sail infinitely." The translation can get a bit clunky at times; prepare to see lines like "I'm Jack Ohara. Nice meet to you" and "This ship is built with a-few-inch-thick ultrahigh-strength steel, it weighs 97,000 tons you know?" The PDF file format also ends up breaking up several two-page spreads into single pages, making for a few awkward transitions. Sure, "CVN 73" may be nothing more than a curiosity to Western audiences in the grand scheme of things. But it does offer an intriguing, somewhat entertaining peek into the inner workings of a carrier at sea. And if that's what the Navy wanted to do with this manga, then mission accomplished.